Diversity Report: Landmark Gains at New York Fashion Week Fall 2017, but Is It Enough? Discussions surrounding diversity in the fashion industry are more prevalent than ever. Season after season, we report the incremental changes in representation on the runways with the hope that next season they’ll be more pronounced; that more designers will embrace models of all races, body shapes, ages and gender identities; that designers will fully incorporate diversity into their brand’s DNA. Given that New York Fashion Week Fall 2017 was essentially one big political rally, we hoped this spirit of equality and humanism would reflect in the runway diversity stats. And in some ways it did. But real structural change needs to happen before runways become systemically diverse. Sara Ziff, an advocate for models and founder of The Model Alliance, is doubtful we’ll see significant change “without clear financial incentives or penalties for designers to prioritize health and be inclusive across categories.” Ziff explains, “Like a pyramid, there are a small group of gatekeepers at the top who decide which models will represent the beauty ideal and these models reflect these individuals’ tastes and preferences — and, of course, their biases.” Still, some have managed to effect change. Let’s see how much. Fall 2016 remains the most racially diverse New York Fashion Week in recent history with Fall 2017 close behind. After examining 116 major New York shows and tallying 2,700 runway appearances, we discovered that 68.5 percent of castings were white and 31.5 percent were nonwhite. 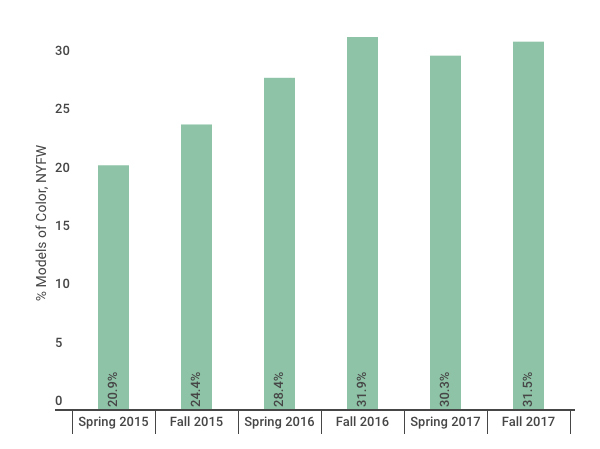 That’s a slight improvement over the 30.3 percent we reported for Spring 2017 and nearly on par with the 31.9 percent we saw in Fall 2016. More importantly, this is the first season where every runway included at least one model of color. Despite the progressive trend, some designers failed to adequately represent people of color on their runways. 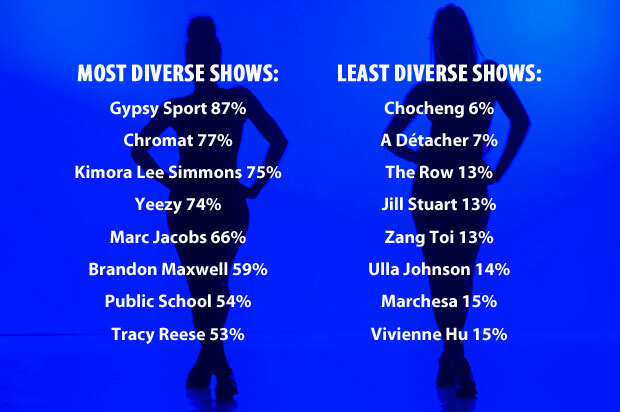 Curiously, Chocheng, helmed by an Asian designer, featured only one model of color out of 17 for a diversity score of 6 percent. (Inspired by the Golden Age of Hollywood, Chocheng Fall 2017 stayed true to its concept.) Mona Kowalska’s A Détacher earned the second lowest diversity rating (7 percent). The presentation — a major theme of which was, ironically, things “going awry” — included only one nonwhite model alongside 14 white models. 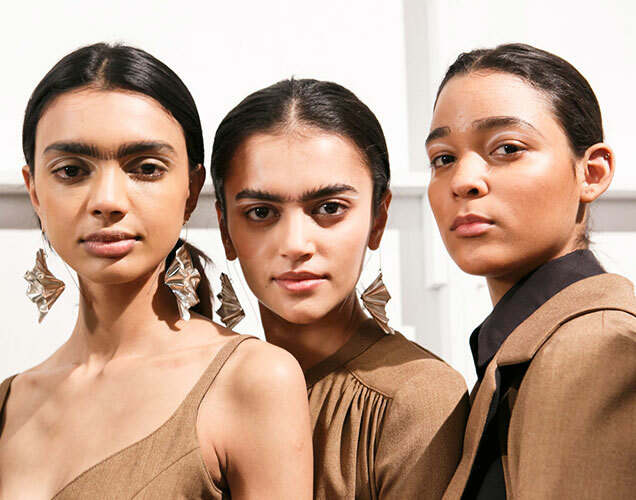 The Row’s latest collection came decorated with words like “hope,” “freedom,” “dignity” and “unity.” Still, the brand continued to favor white models with a 13 percent diversity score. While not impressive, it’s a welcome improvement over last season’s 0 percent score. 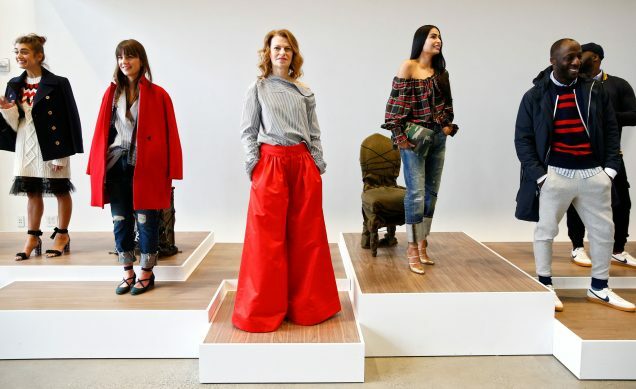 Matching The Row’s stats were Jill Stuart and Zang Toi, while Ulla Johnson’s diversity score was only slightly better at 14 percent. 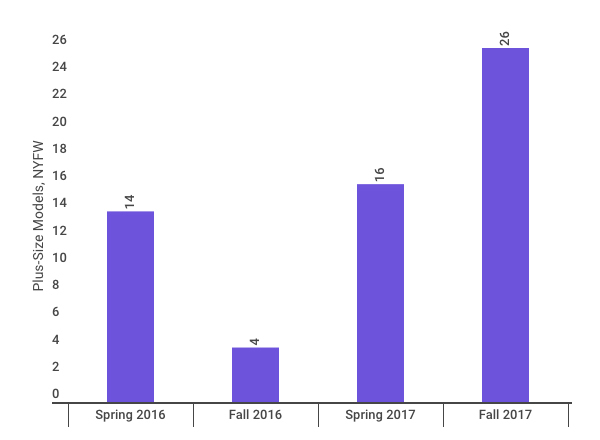 Repeat offender Vivienne Hu earned a diversity score of 15 percent — a 9 point improvement over Spring 2017, but still among the weakest diversity ratings of the Fall 2017 season. Marchesa also came in at 15 percent, casting four nonwhite models and 22 white models. All things considered, it is worth noting that only two brands earned a diversity score below 10 percent. On the opposite end of the spectrum are the designers who make inclusion, racial and otherwise, a priority every single season. Though she cited a 20th-century Italian heiress as the muse behind her collection, Kimora Lee Simmons acknowledged her 21st-century consumer with a predominantly (75 percent) nonwhite cast. Kanye West, who recognized his critics in the form of a punctual, conveniently located, fresh-feeling Yeezy Season 5, continued to make headlines thanks to his commitment to diversity. Seventy-four percent of Yeezy’s holograms-turned-humans were models of color. Though a slightly less impressive figure than last season’s 97 percent, West raised the diversity bar by casting hijab-wearing model Halima Aden. Brandon Maxwell also returned to our most inclusive runway list with a 59 percent diversity rating (down from 69 percent in Spring 2017). Another high-profile, highly-diverse mea culpa came from fashion week closer Marc Jacobs, who sent a cast of mostly nonblack models down the runway in candy-colored dreadlocks last season. In contrast, Jacobs’ Fall 2017 runway featured tasteful homages to hip-hop culture, 66 percent models of color, three transgender women (Stav Strashko, Dara and Avie Acosta) and transgender male model/Insta activist Casil McArthur*. Appropriation accusations aside, Jacobs is one of the few old-guard designers who has long made political involvement part of his brand. Rio Uribe of Gypsy Sport took activism and action several steps further. Tents lined Gypsy Sport’s Fall 2017 runway, an ode to those who live outdoors “both by choice and circumstance.” Uribe’s politically tinged runway was not only the season’s most racially diverse, it was among the most inclusive on all counts. Gypsy Sport featured 87 percent models of color, two transgender models (Maya Monés, Pan Dulce), one plus-size model (Minahil Mahmood aka Mina), one model with albinism (Diandra Forrest), another with vitiligo (Jesi Taylor) and several “real people” that Uribe met at various political demonstrations, including the Women’s March in Los Angeles and #NoBanNoWall protests in New York. Additionally, Mara Hoffman, which was not among the 116 shows examined for this report, featured one transgender model. Taking this outlier into consideration, Fall 2017 was a breakout season for transgender visibility. Note: 9 of the 14 models in Spring 2016 appeared on the runway of plus-size clothing company Addition Elle. This season, Christian Siriano overtook Chromat as New York Fashion Week’s body diversity champion. (In Spring 2017, Siriano hired five plus-size models to Chromat’s seven.) While his racial diversity score of 31 percent is mediocre, Siriano was responsible for 10 of New York’s 26 plus-size model appearances. 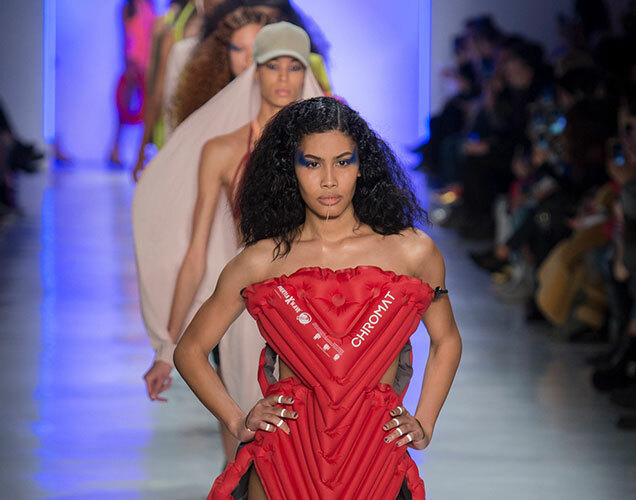 Karlsson, Saffi Karina, Michelle Olson, Precious Lee, Candice Huffine, Georgia Pratt, Marquita Pring, Alessandra Garcia Lorido, Lawrence and Jocelyn Corona graced Siriano’s runway in slinky, often sheer eveningwear that’s bound to be a hit with the inexplicably underserved $19.9 billion U.S. plus-size market. While only nine runways featured plus-size women, big-name brands are beginning to give plus-size women their due. This season, Ashley Graham became the first plus-size woman to walk for Michael Kors. Prabal Gurung cast Pring and Huffine for his equality-touting runway. Pring and Huffine also appeared at cult favorite Tome along with Pratt. It’s worth noting that Tome was one of the few brands to take up the mantle of age diversity, booking Jacky O’Shaughnessy (of American Apparel fame) for the second season running. Last season, Ralph Lauren, Michael Kors, Tom Ford, Rachel Comey, Opening Ceremony and Eckhaus Latta boosted New York’s age diversity score — eight models over age 50 walked. In Fall 2017, that number dipped to six. In addition to O’Shaughnessy at Tome, Collier Schorr walked for Eckhaus Latta and Juliette Branker for Creatures of the Wind. How Inclusive Was NYFW Overall? A wider representation of sizes on the runways would have far-reaching effects. 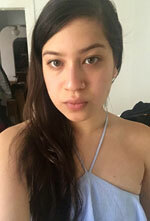 Claire Mysko, CEO of the National Eating Disorders Association says, “The images we see in the media and on the runway can have a big impact on those affected by and at risk for eating disorders.” Mysko hopes more designers and casting agents will make social responsibility a priority and follow the example of designers like Chromat. It’s hard to say whether our findings would vary had diversity-leaning designers like Rebecca Minkoff, Comey and Hood By Air not absconded to Los Angeles and Paris. Last season, Minkoff’s runway featured 62 percent models of color. Transgender model Ines Rau walked at Hood By Air. Comey’s streetwise Spring 2017 presentation featured multiple aged models as well as downtown personality and queer muse Richie Shazam. Stay tuned for our full Fall 2017 diversity report coming at the end of fashion month. Additional reporting by Mark E.
UPDATE 2/24/17: This report has been updated to include three transgender models cast in the Marc Jacobs show and one in Philipp Plein. *Casil McArthur was not included in this report, which examined only female models.